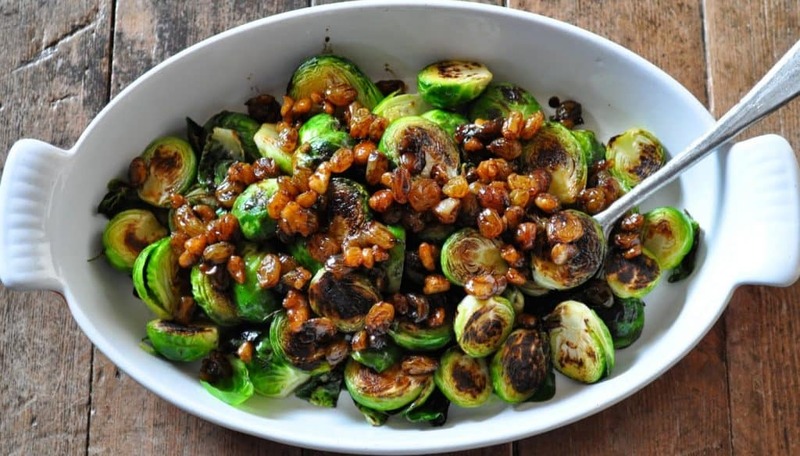 A recipe for Pan Roasted Brussels Sprouts dressed with Pickled Raisins and Black Walnuts in a Balsamic Reduction. 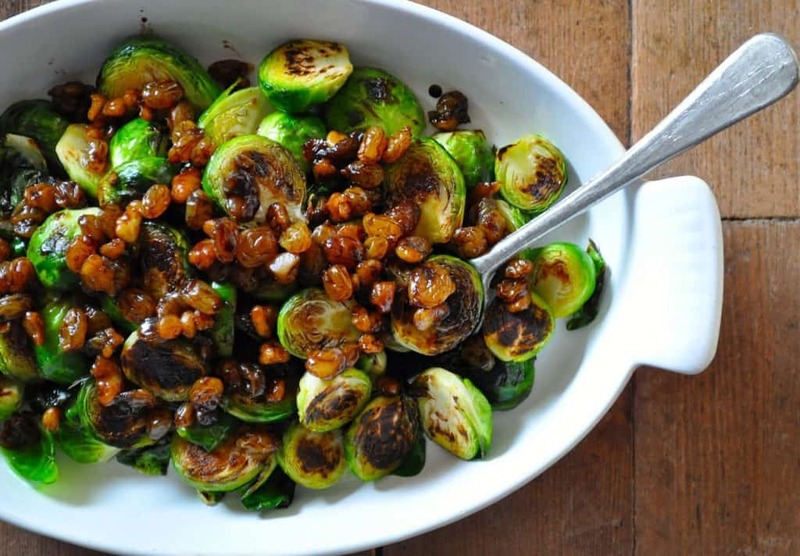 The nicest part of this recipe is you don’t need to have pickled raisins you’re going to make them. And they are everything! I came across pickled raisins when we attended the Beer and Cheese Pairing. I suspiciously tasted one with a tidbit of cheese, it was like a pillow of flavor bursting against the cheese, essentially balancing the bite perfectly, right in my mouth, I was smitten. So I bought a jar to play around with and nibble on, also to figure out how to make my own version of them. I did some Internet research once I got home and found a few recipes for different pickled dried fruits. Many of them called for simmering the dried fruits in vinegar while adding other flavors to the mix like wine, spices and herbs. My head got to working on the idea of pickling raisins in balsamic vinegar and it was an easy jump to reducing the vinegar while simultaneously pickling the raisins. 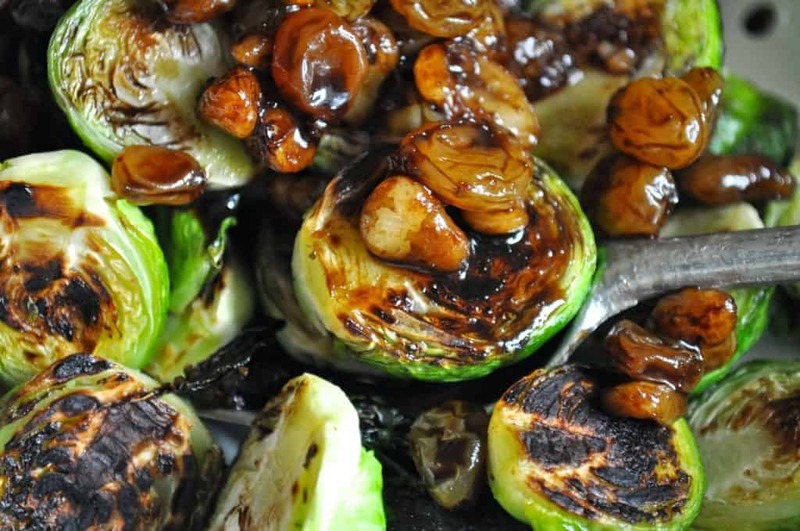 I love the fact that you’re basically making homemade pickled raisins directly IN the balsamic dressing reduction for the brussels sprouts. I’ll admit the black walnuts were impulsive, yet their funky tang was the perfect touch to the dressing and they hold up better than you’d think to simmering. Use English walnuts if you need to, but if you can lay your hands on black walnuts I highly recommend them for their flavor. These are another new discovery for me, for years I was determined to despise them. And I did until I tried them again as an adult. 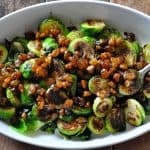 I love this recipe for Pan Roasted Brussels Sprouts dressed with Pickled Raisins and Black Walnuts in a Balsamic Reduction. you can make the vinegar reduction up to 3 days ahead of time and store in the refrigerator. To warm it up just pour it into a small sauce pan, set it over a very low temperature burner, stirring occasionally until warmed through, be sure you don't reduce it more or burn it.